If Colombia is almost everyone’s favourite country, Medellin is almost everyone’s favourite city. All over Colombia and Central and South America, backpackers in hostels are shouting about how amazing Medellin is and about the great time they had there. I don’t think I met anyone that wasn’t actively recommending that you go there and that you stay as long as you can. And that is my first piece of advice on Medellin- you really can’t stay long enough. There are people I met there that ended up staying for three whole months! I extended my flight twice to stay longer and I still cried when I had to leave. So, what makes this city so special? I think the reason that so many backpackers love Colombia is because of the lack of mainstream tourism. In most places throughout the world you’ll find a healthy mix of travellers- luxury travellers, mid-range travellers and of course backpackers. Instead Colombia kind of just felt like a backpacker heaven. I’m not sure I met any tourists in the country that weren’t backpacking in the traditional sense. It’s probably the reason why there are so many good hostels and cheap group day tours. Medellin is the centre of that so-called backpacker heaven, with the best hostels, the best bars and to sound terribly cliché- the best all round good vibes. Also, less than a decade ago Medellin was the most dangerous city in the world. As home of infamous drug lord Pablo Escobar, it was plagued with random bombings, shootings and all round violence. Hence the local people here are not quite used to tourists yet. They’ll often stop on the street and stare at you. Or if they are a little braver they’ll start to talk to you. They always have a smile on their face and they never seem to want anything from you. I think it’s the people of Medellin that make it is so incredibly special. The only place you’ll want to be staying in Medellin is the area called El Poblado. It’s where you’ll find all the best hostels, a huge number of amazing bars and clubs and a great selection of restaurants offering everything from local Colombia cuisine to Mexican and Italian. Given its popularity among tourists the area is super gentrified and you’ll pay more than in other places in Medellin. But this part of the city is so beautiful and full of life that you really can’t stay anywhere else. On any given night in Medellin our night would usually begin with some casual drinks on the rooftop of our hostel- Casa Kiwi. I’d gotten a ridiculous amount of recommendations from fellow travellers to stay at this hostel. It’s notoriously difficult to book online but if you just rock up sometime in the morning they should have a bed for you. Given that so many visitors continuously extend their stay they put very few of their beds online, and instead will release beds to walk ins once people have confirmed they are leaving. It’s why so many people spend so long in Medellin. They are relaxed up on the rooftop- there is a bar up there but they didn’t really care if we had our own bottle of Tequila on the table. Another famous hostel is the Happy Buddha, but from all accounts the bar is far better than the hostel itself. We’d often head here for their happy hour or for some other drink specials. Or after we got kicked off the rooftop. From the hostels bars, it is an easy jump to some of the bars and the clubs. I usually just followed the crowd and I can’t remember the names of any of the places we went. But you can’t really go wrong in El Poblado. I don’t think I ever slept more than 4-5 hours a night the whole time I was in Medellin. Most mornings we would stumble in around 6am and get a couple of hours of rest before waking up and going exploring. One time we met a local guy at a club and a group of us ended up on an adventure to his apartment to kick on until lunchtime. I’m not sure that was the smartest idea I’ve ever had! Lucky he was a nice a guy. The nightlife is the biggest drawcard in Medellin. It’s not a city where you should feel guilty about partying through the night and sleeping the day away. Half of the culture experience of Medellin is at night and it’s not something you want to miss. Hence the longer you stay in Medellin the better because you’ll have lots of time to explore the city itself. 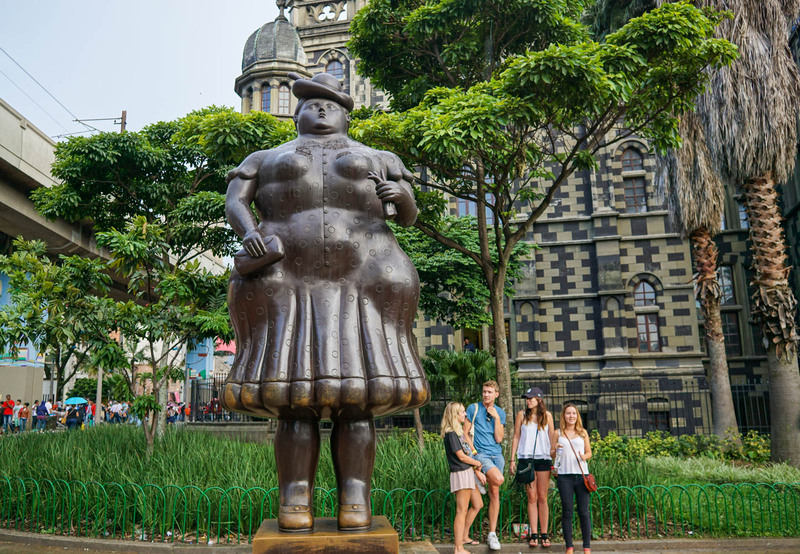 If there is one touristy thing you do in Medellin then it must be this free walking tour. I’d guess that I’ve done more than a hundred free walking tours. I do them in almost every city I visited and I’ve had bad ones and great ones. But none of them compare to the three-hour walking tour I did with Real City Tour Medellin. It is hands down the best free walking tour I have ever been on. And pretty much everyone on my tour thought the same thing. This tour through the main part of Medellin takes you on a journey through the history of Medellin. Usually I find on walking tours that once it hits the 1.5-hour mark, my attention span drops significantly. That just was not the case with this walking tour. During the tour, we were bombarded with so much information about the city including its culture, its people and its long and often terrible history. But our tour guide was so engaging that I never felt like I was getting too much information. He was also careful to find us a place to sit down when he had a particularly long story to tell. And he allocated some break time for food halfway through the tour. I don’t think we just got lucky with our tour guide though- I think that is just how Real City Tours trains them. Medellin at times is a misunderstood city. Most people’s knowledge is limited to what Netflix told them on Narcos, or simply that the city is super dangerous. Hence why I think it is so important to join this walking tour. I’m assuming here that most of you basically know who he is. But for those that don’t, Escobar is one of the main reasons that Colombia used to be such a dangerous place. Escobar is a famous drug lord whose cartel once supplied around 80% of the cocaine found in the US. Apparently he earned upwards of 20 billion dollars a year for his endeavours. He is responsible for thousands of deaths in Colombia. He was essentially a terrorist in that he did a lot of terrible things like bomb public places in order to intimidate the government and prevent himself from going to prison or being extradited to the US for his crimes. There are a range of Pablo Escobar themed day tours. The popular one with backpackers is the tour where you go to one of Pablo Escobar’s old mansions and play paintball. Obviously this isn’t exactly a very informative tour. In contrast, the one I went on took us to a range of places in and outside of Medellin that were important to the story of Pablo Escobar. Some of the stops we made on the tour were to his house, his grave and the place where he was finally killed. As we made these stops we got pieces of the story that finally came together to paint a picture on the really story. Big surprise- Narcos isn’t really an accurate description of what happened and is criticised in much of Colombia for romanticising the life of Escobar. Obviously, the people of Medellin aren’t proud of Escobar’s history. But if there is one thing they are proud about it is their world class public transport system. Medellin has a great metro system that includes trains and cable cars. The cable cars are a great way to see the city and given they are part of the metro network, it is a cheap activity. Unfortunately I never got round to doing this particular activity but it is definitely on my list for next time. After all, I am going to spend a minimum two weeks in the city next time! There are some great day trips and multiday trips from Medellin. Guatepe is a famous rock overlooking an incredible view and I’m still kicking myself that I didn’t have enough time to go visit it. It can be visited in a day, although some people do give it an overnight trip. Salento is about five hours from Medellin so it can’t be done in a day trip, but lots of backpackers head there during the week and then pop back to Medellin for another weekend of partying. There is a huge English blog completely dedicated to all things Medellin. So if you are looking for more advice about this amazing city had on over to Medellin Living.